Bhandeswari Jain Temple In Bikaner Is A Fifteenth Century Building Well Known For Its Mirror Work, Gold Leaf Paintings And Mirror Work. 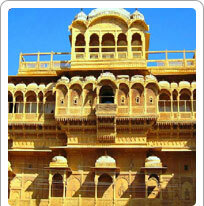 Havelis Are Beautiful Mansions Reminiscent Of A Lavish Style Of The Previous Centuries. Large mansions of the wealthy people and nobility are known as Havelis. In Bikaner, the Havelis are very popular for sightseeing with tourists because of the beauty of their carvings, sprawling courtyards, frescoes, mirror work on the walls, gold leaf paintings and several other remnants of an affluent lifestyle. The recommended Havelis worth a visit are Gogagate, Daddhon Ka Chowk, Rangari Chowk, Assanion Ka Chowk, Mohta Chowk, Binnanion Ka Chowk Daga Chowk, BK School and Jassuar Gate. The Bhandeswari Jain Temple, a fifteenth century building and the oldest in Bikaner, is famous for the quality of workmanship and the beauty of its interiors done up in gold leaf and with frescoes.